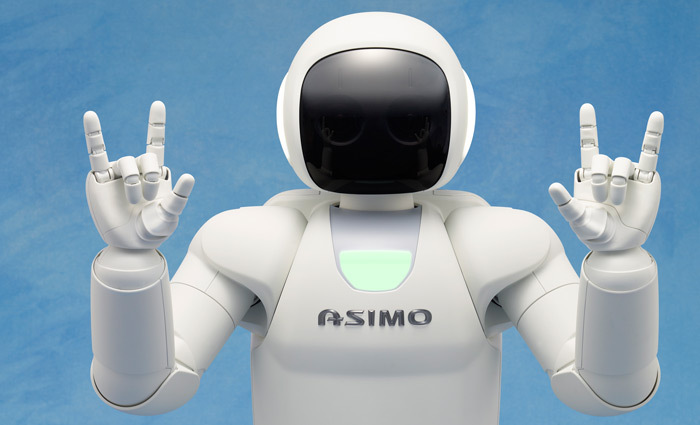 The new ASIMO is lighter and faster. It weighs 48kg (6 less than the previous version), it can run faster, reaching 9km/h (instead of 6km/h) and it has improved dynamic stability. It can hop, move over uneven surfaces, kick a ball and even compensate to small perturbations like an accidental push. It may not be yet as stable as for example the robots of Boston Dynamics, but we shouldn’t forget that they are either tethered prototypes or multi-legged robots while ASIMO is a biped that moves freely. Advancement of its intelligence capabilities allow it to acknowledges data from its surroundings and act autonomously. It takes into account other people’s movement and adjusts its path according to where they are and also where it predicts they go. Additionally it has advanced face and voice recognition and can interact when multiple persons address to it. The new version has 57 degrees of freedom, 23 more than before. This increase is mostly due to the much more advanced fingers. 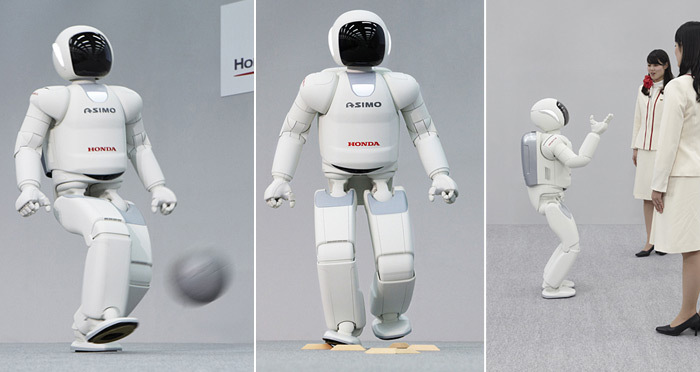 As displayed in the photos above and in this video, ASIMO can perform elaborate movements and handle a variety of objects with advanced dexterity. 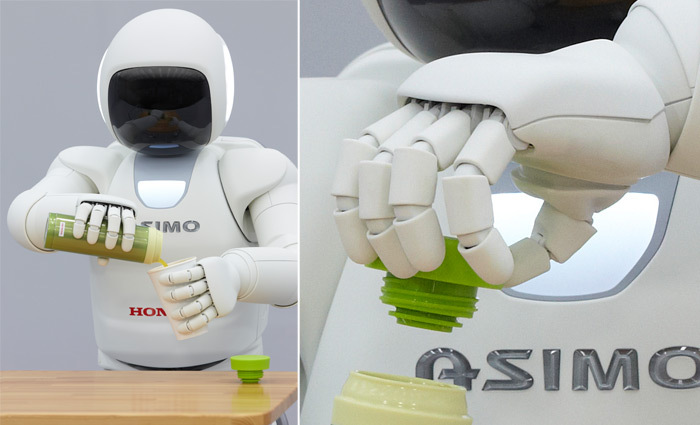 For the first time in its long history, ASIMO is available in three different colors. At first this looks like a minor detail (considering the color variations are very discreet) but it may well be the most important new feature as a hint to a future production version. With the establishment of Honda Robotics as a separate division that covers all robotic research, and product applications the day when ASIMO or other robotic products will be commercially available becomes closer. Honda has the resources to pursue this goal and can endure the extremely steep process of developing an elaborate product for consumer use. 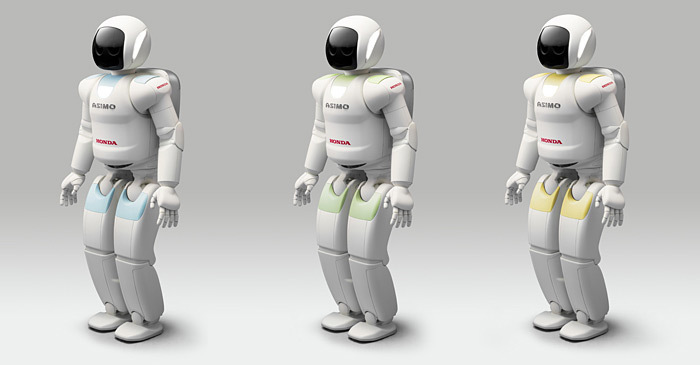 You can read the official press release by Honda:http://world.honda.com/..All-new-ASIMO/..